Every new RV usually comes off the lot with a "convenience package" or "welcome package" included to get you, the new RVer, off on the right foot. Beyond the 4-pack of special quick-dissolving toilet paper, a blue sewer hose that resembles a slinky dipped in plastic, and a 25-foot white garden hose to supply you with drinking water, there is almost always one other item: a small 3-pronged electrical adapter that seldom gets any explanation or warning as to its proper use. That little 30-amp adapter allows you to plug a heavy-duty 30-amp power cord into a standard household outlet. It’s very handy. Seldom do residential homes come with the much larger 30-amp receptacle. Small- to mid-sized RVs (both motorhomes and trailers) come standard with a 30-amp power cord. Exterior household outlets are rated at 20 amps. 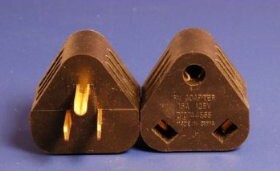 That’s the reason behind the different style of plug. However, when you make use of an adapter to basically force the 20-amp circuit to supply your RV with power, a few concessions are necessary in order to prevent electrical problems. The first priority is to make sure you don’t attempt to use the air conditioner. In most RVs, this one appliance draws the most electricity. Using it may blow circuit breakers in your house, but not in your RV. In the event that you do use the A/C, you may very well do serious damage to the electrical components. When you restrict the flow of electricity by using an adapter hooked to the smaller household circuit you may create what is called a “brown out" condition. Meaning, there may be a voltage drop because of the added resistance. Most RVs have a rather lengthy power cord to assure your ability to reach the outlet at the campground, no matter where it’s located on your campsite. This extra length may allow the 20-amp house circuit breaker from tripping — so you may think everything is okay. But there will still be a sizable voltage drop that may not have an immediate effect, and in a matter of time (minutes or even hours) the heat created by operating your A/C at low voltage will take its toll. What if your RV is just far enough away from the house that the standard power cord won’t reach? No problem. There’s always that 100-foot cord in the garage that you used for the Christmas lights last year. If your power cord is too short, move the RV closer. By using a long extension cord, the voltage drop will be so dramatic that about all you will be able to run will be one single lightbulb. And rest assured, it will be dim. There are lots of expensive electrical devices that will be damaged in low voltage conditions. Your power converter, microwave, radio (or stereo), TVs… and the list goes on. If your voltage drops below 110 volts, you will do damage. Low voltage at home isn’t the only way to get into trouble. Today’s RVs come either in the aforementioned 30-amp configuration, or with many larger RVs a 50-amp setup is required. Many campgrounds that have been around for decades haven’t made the financial investment to upgrade their electrical service to accommodate RVs equipped with electric clothes washers and dryers, electric fireplaces, additional space heaters, or an endless quantity of electronic entertainment devices. We even had a small electric chest freezer in our fifth wheel when we lived in it down south. Imagine the electrical draw created when a hundred or so large RVs are running their air conditioners all day during a hot spell down south. Even parks that are usually well-equipped can be in a “brown out” condition if the demand is unusually high. Checking the quality of the electricity at the parks you visit is a simple as using a Kill-A-Watt meter to verify your power source has the correct voltage and is operating at the correct frequency too. Another helpful device is a voltage regulator or power conditioner which acts like your own private power transformer to modify what is available at your park campsite and make sure it’s able to handle the load of your heated tile floor and electric heated towel racks. Many a fire has been started by trying to use too many things through an adapter. Appliances such as toasters, electric heaters, anything with a heating element requires a lot of juice. When they don’t get enough, things heat up quickly. Adapters can melt and short out, and fire will quickly be the end result. Use extreme caution when you choose to adapt your power cord down to match a power source that wasn’t intended to carry such a heavy load. Carelessness can be real expensive.